Microsoft announced the new Surface 3, which runs full Windows instead of Windows RT. It features a quad-core Atom processor and full HD 10.8 inch screen for $499. Insight and details on the new tablet were announced on Microsoft’s Surface blog. The Surface 3 is smaller and cheaper than the Surface Pro 3 and with a keyboard cover, can still function as a laptop replacement. A Type Cover, which is a Surface 3 cover that gives you an almost complete keyboard, costs $129. If you have a Microsoft Surface Pro 3 or are familiar with them, then you should be impressed with the new Surface 3. The Surface Pro 3 is already small and fast, but the Surface 3 will have a slightly brighter and higher quality screen. The only huge downside I found with the Surface Pro 3 is if you wanted to download an app, it had to be in your Google store. If the Google store didn’t supply the application that you want, then you can’t download that app. On the bright side, the Surface 3 as well as the Surface Pro 3 come with a USB port, not many tablets have this feature. 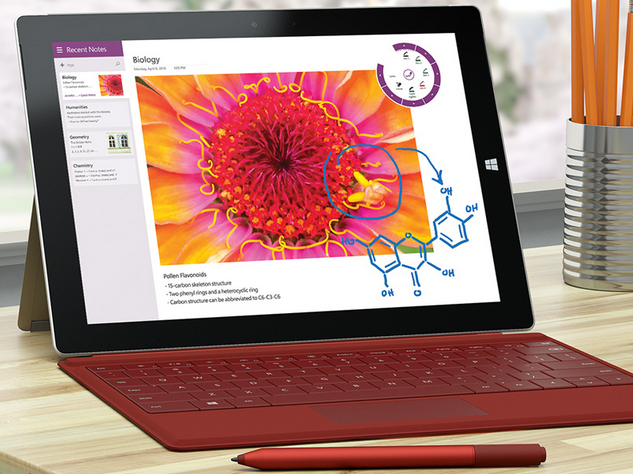 The Surface 3 is the first Surface tablet to Intel’s quad-core Atom x7 CPU, running at 2.4 GHz. The tablet also uses a micro USB charger rather than the Surface’s traditional proprietary connector and if you’re like me, this will be very convenient when all of my devices also use micro USB, so you won’t have to worry about packing up multiple chargers when you’re on the go. The device comes equipped with an 8 MP rear camera and a 3.5 MP front camera, compared to 5 MP in both the rear and front on the Surface Pro 3. You will have a choice between a model with 2 GB RAM and 64 GB storage at $499, or one with 4 GB RAM and 128 GB storage at $599. Either one you decide to get, they all come with a microSD slot, which means that you can expand the device’s memory. Beyond that, the Surface 3 measures 10.5 x 7.4 x 0.3 inches, weighs 1.4 lbs, and features a 1920 x 1280 display. All Surface 3s will have the ability to connect to 4G LTE networks, though no information on which mobile carriers the device will be available for has been releaed. Out of the box, the tablet will run Windows 8.1, but it will be able to upgrade to Windows 10 later on. I have a Windows phone that runs Windows 8.1, I’m pretty satisfied with it as is, but if it could upgrade to Windows 10 then I’d be more than happy with the improvement. So if the Surface 3 is sounding like something you want to get your hands on, especially if you’re looking for a laptop replacement, then keep your eyes open. Laptop Mag will be releasing a full review of the Surface 3 as soon as possible. The device will likely be available at any retailer that carries Surface Pro 3s and will launch on May 5. Need a Surface Pro 3 Rental for your Business? Rentacomputer.com is your #1 Technology Rental Provider! Previous Post: Make Your Own Raspberry Pi – Laptop!